Periodic Table What is the element Fluorine as on the Periodic Table? Elements can be classified based on their physical states (States of Matter) e.g. gas, solid or liquid. This element is a gas. Fluorine is classified as an element in the 'Halogens' section which can be located in group 7 of the Periodic Table. The term "halogen" means "salt-former" and compounds containing halogens are called "salts". The halogens exist, at room temperature, in all three states of matter - Gases such as Fluorine & Chlorine, Solids such as Iodine and Astatine and Liquid as in Bromine. For additional facts refer to Fluorine Properties. A pale-yellow, highly corrosive, poisonous, gaseous halogen element, the most electronegative and most reactive of all the elements, used in a wide variety of industrially important compounds. Fluorine is so reactive that glass, metals, and even water, as well as other substances, burn with a bright flame in a jet of fluorine gas. The Atomic Number of this element is 9 and the Element Symbol is F.
In a general overview of the element we can at first describe Fluorine as a pale yellow, white or colourless gas which can sometimes be fluorescent. It is present in volcanic gases and thermal waters. Its chief source is fluorite but it also occurs in cryolite, seawater, bones, and teeth. Fluorine can only be produced by electrolysis under special conditions. Its most important compounds are fluorite, cryolite, and topaz. The name 'Flourine' was coined in 1813 the by English chemist Sir Humphry Davy from fluorspar, the name of the mineral where it was first found. Fluorspar is the chief ore of fluorine. Its composition is calcium fluoride. The mineral name of fluorspar was given by Georg Agricola in 1546, translating the German name flusse from the Latin word fluxus meaning "flowing or to flow". In metallurgy, a flux is also derived from the Latin word fluxus and is a chemical cleaning agent or flowing agent. First described in 1529 by Georigius Agricola (1494-1555) for its use as a flux. In 1813 Sir Humphry Davy experimented with Fluorspar and attempted the extraction of Flourine, but failed. George Gore was able to produce a small amount of fluorine through an electrolytic process in 1869. It was successfully isolated by Henri Moissan, a French chemist, in 1886. He achieved this through the electrolysis of potassium fluoride and hydrofluoric acid. 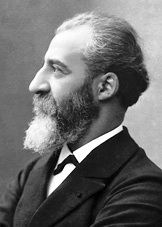 In 1906 Henri Moissan won the Nobel Prize in Chemistry for his work in isolating fluorine from its compounds. Interesting information on the Medical Uses of Fluorine, Health and Treatments. Small amounts of sodium fluoride added to the water supplies will reduce the incidence of dental cavities, particularly among children. Excessive amounts of fluoride can mottle tooth enamel and cause osteosclerosis (an area of dense but normal bone in the jaws). Soluble fluorides added to public water supplies have reduced the incidence of tooth decay. It is also used in Toothpaste. Other uses of Fluorine include the extraction of uranium, in Air conditioning and Refrigeration and also as an insecticide. Fluorocarbons such as Teflon have found extensive use as lubricants because of their low friction. Check out Fluorine on the Periodic Table which arranges each chemical element according to its atomic number, as based on the Periodic Law, so that chemical elements with similar properties are in the same column. Our Periodic Table is simple to use - just click on the symbol for Fluorine as on the Periodic Table for additional information and for an instant comparison of the Atomic Weight, Melting Point, Boiling Point and Mass - G/cc with any other element. An invaluable source of facts and information as a Chemistry reference guide. The Standardised Periodic Table in use today was agreed by the International Union of Pure Applied Chemistry, IUPAC, in 1985 and now recognises more periods and elements than Dimitri Mendeleev knew in his day in his day but still all fitting into his concept of the "Periodic Table" in which Fluorine is just one element that can be found. These articles contain facts and information relating to Fluorine and each of the other elements including the Periodic Symbol, group, classification, properties and atomic number which is often referred to as the Periodic Table Number. Test your knowledge of chemistry and the Periodic Table by completing the Element Symbols and Atomic Numbers on our Blank Periodic Table. Chemistry students will also find a helpful section on Chemical Formulas.